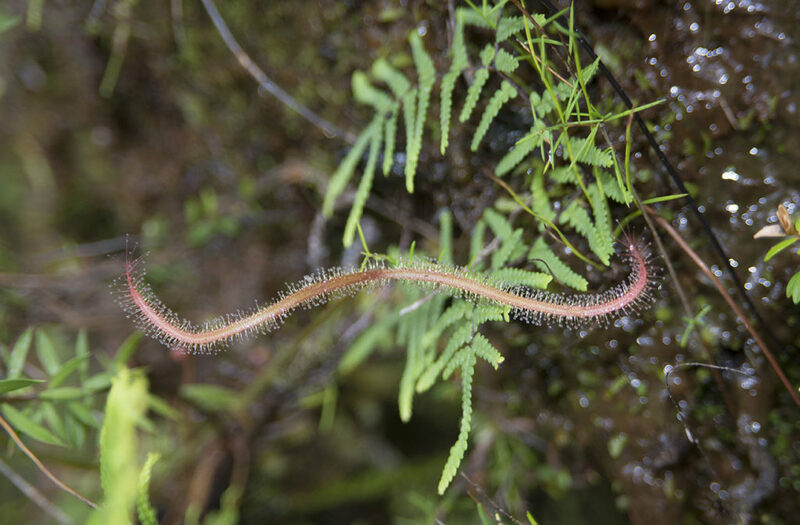 Drosera spatulata in habitat, Blue Mountains National Park, December 2016. Photo Tique Aroustian. If you have ever experienced that extended period of cold, rainy darkness known as Berlin winter, you will agree that escaping it even for a few weeks can be a good idea. Even more so if you cultivate botanical interests: at that time of the year the plants in my garden are dormant, nurseries are shut and the outdoor is not suitable for human activity. But I have the luck of being romantically involved with an Antipodean, which made a perfect excuse to leave this hemisphere and go spend in Sydney what has been for me the hottest December ever. Australia is widely known as a naturalist’s paradise, but the fame of its animals far surpasses that of its plants; it’s the latter, though, that shape a landscape deeply alien to what European eyes are accustomed to. Australian flora has its origins in the Gondwanan rainforests: many relict species come straight from back then – as is the case with several ferns and cycads –, while others evolved to adapt to the Eocene climate change that made the country such an arid place; the eucalypt and the wattle have won predominance thanks to their resistance to heat and fire. With their convoluted branches and the colourful patterns of their barks, Australian trees are nothing like the trees we are used to in Europe – their foliage proved a challenge to the early European painters who failed at depicting them realistically, turning the sparse, hard leaves of sclerophyll vegetation into the leafy green masses of the Old World. Australia is also a center of diversity for carnivorous plants – not surprising for a place where everything is both weird and dangerous – with six endemic genera represented by 187 species. Two of those genera, Byblis and Cephalotus, only occur in Western Australia, so I couldn’t plan to observe any; on my search list were Drosera and Utricularia, the bladderworts. Knowing their habitat preferences – humid, sunny places with nutrient-poor soil – we set out to find them in the numerous national parks that surround Sydney and explored a variety of different ecosystems, always keeping an eye to the bottom of the bush, as carnivorous plants are small and low-dwelling. In Ku-ring-gai Chase we saw palm groves and epiphytic orchids, gigantic staghorn ferns and hanging tillandsias, plus a thick undergrowth swarming with friendly creatures like leeches, the enormous bull ants and the paralysis tick, a nasty parasite that has decided paralysis was not enough, and carries with its bite an additional horrible thing called alpha-gal allergy: it makes you allergic to mammal meat. There were also nicer animals though, and we had the luck to spot a sea eagle, as well as my first lyre bird: a bird of paradise in the wild is a breathtaking sight – especially if you come from a place where the fancier birds you can meet are the common pheasants. The park also houses the Red Hands Cave, with its aboriginal rock art dating back from 5000 years ago – plenty of attractions indeed, but not a trace of carnivorous plants. We searched for them further in Botany Bay, whose name celebrates plant science superstar Joseph Banks, and his comprehensible enthusiasm at the sight of the local vegetation as he landed with James Cooks’ expedition in 1770; the coastal habitat is dominated by his namesake, the Banksia, with its surreal-looking flowers and seedpods. French botanist Jacques Labillardière, the first to describe the continent’s carnivorous flora, landed here in 1792, and his name too appears often in the toponomy and taxonomy of the region. Despite such excellent historical credentials, our plants were nowhere to be seen. Drosera binata var. dichotoma in habitat, Blue Mountains National Park, December 2016. Photo Jason Renel. We finally found them in Grose Valley, on the Blue Mountains – a mountain range that is a National Park and UNESCO heritage site, about an hour’s drive west of Sydney. The name refers to the blue tinge that seems to envelop them in the distance, and is due to the volatile terpenoids released into the air by the eucalyptus trees: the tiny particles favour the scattering of short wavelengths – a phenomenon called Mie scattering – and it all looks blue. There’s lots of eucalypts in the park: 91 species. Blue Mountains aren’t mountains in a strict geological sense, but rather a sandstone plateau that formed when the sedimentary bedrock was uplifted, and was then carved by erosion into the steep cliffs and gorges we see now. Volcanic action created basalt caps here and there, and even though they are not that high – 1300 meters at their highest points – they were long considered impassable, therefore perfect to deter the convicts of the Sydney penal colony from attempting to escape into what they thought was China. We started our expedition from Govett’s Leap, a lookout that offers a magnificent view of the Blue Mountains – the same Charles Darwin saw almost two centuries years ago, while he was there in 1836: “early in the day the gulf was filled with a thin blue haze, which, although destroying the general effect of the view, added to the apparent depth at which the forest was stretched out beneath our feet” (Ch. XIX). It also adds to the mysteriousness of a scenery that looks right out of Deep Time: the forest covers the bottom of the valley and the top of the plateaus as well, and it’s easy to imagine pterodactyls diving down those cliffs. 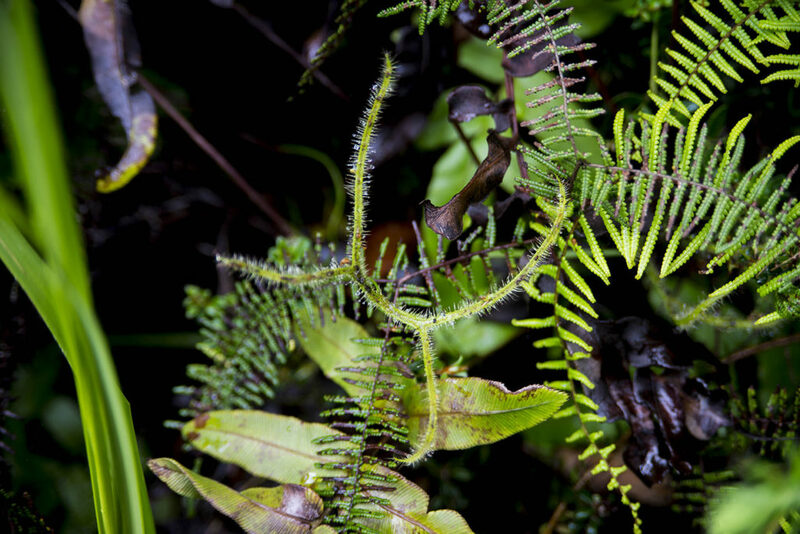 We took a track that descended into the valley, onto slippery steps surrounded by ancient-looking tree ferns and the huge leaves of the cycads, and almost immediately we found them: on the humid, moss-covered surface of a rocky wall, a dozen tiny Drosera stood out like stars, their round rosettes shiny with dew and flamboyantly red. I had never seen a carnivorous plant in the wild before, and the effect was intense. It’s a bit like meeting a celebrity in person, only there’s less chances a plant will let you down. And if you’re used to see them in a pot, isolated objects in an alien surrounding, the sight of them in their context is a reminder of the complexity of these organisms and of their behaviour. 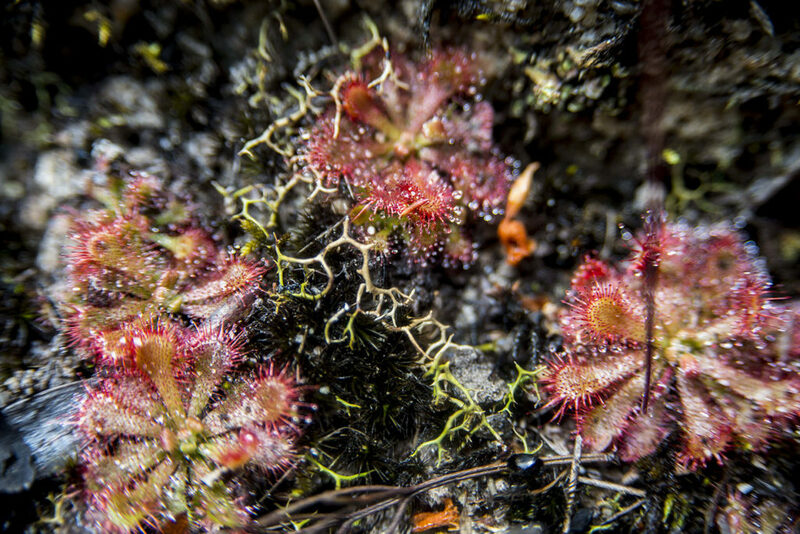 There’s lots to learn from where they grow and how: these little Drosera always appeared in groups, on the side of rocks or sandy terrains, always on a clearing where they could be reached by sunlight, but also close enough to wet mosses and springs that guarantee constant humidity. Many plants were covered in the remains of those unfortunate among the insects that crawl in the undergrowth, their place in their environment being also effective for feeding purposes. 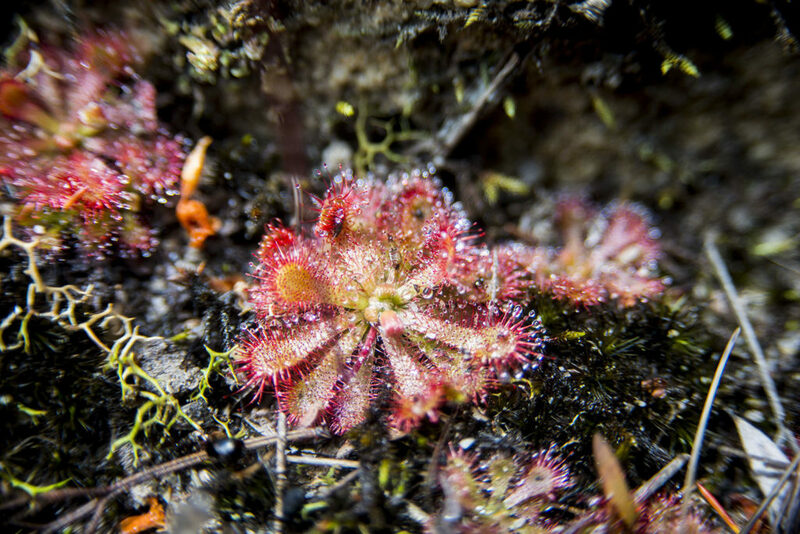 If my identification is correct, they were examples of D. spatulata, the spoon-leaved sundew – tiny, with both flower stalk and sepals covered with the sticky tentacles that represents its distinctive sign. It’s a fairly common species, with a wide distribution range that goes from China and Japan and cover almost all of Australasia – not that this makes it any less remarkable. We found many of them, always grouped in crowded spots, throughout our walk: it was noticeable how radically the environment changed from the relatively dry sunny side of the mountains to the shadier, humid one. Humidity is a must for carnivorous plants, and descending towards the bottom of the valley we reached a small river, its cold waters the home for a number of tiny fishes. On its banks, I searched for Utricularia, a genus that loves being almost completely submerged as it catches its prey with its underwater suction-trap bladders, but found no sign of them. They are very small, with leaves a few millimetres long, and spotting them when they’re not in bloom is almost impossible, at least for an armchair botanist like me. Triboniophorus graeffei, the red triangle slug. Drosera binata var. t-form in habitat, Blue Mountains National Park, December 2016. Photo Jason Renel. “These cliffs are composed of horizontal strata of whitish sandstone; and are so absolutely vertical, that in many places a person standing on the edge and throwing down a stone, can see it strike the trees in the abyss below”, as Darwin put it (Ch. XIX), and our walking track went all the way around the summit of the plateau up to the Pulpit Rock lookout – a spectacular place, not recommended if you’re afraid of heights. From there you can see a whole panorama that looks like a Grand Canyon immersed in forest, and I was amazed by the sound of little bells in the distance, coming from every direction in the green gulf: as a European, I wondered how could there be cowbells there, maybe pastures in a faraway valley? Of course not, it was the bellbirds. There we also realized how little space separated the track from the abyss, an awareness that made our way back a much more cautious affair than the way up. Falling wasn’t the only life-threatening danger: along the path we encountered the one animal I feared the most: Atrax robustus, the Sydney Funnel-web spider. The most venomous spider in the world was sitting in its web, its fangs protruding, at about ten centimetres from my foot: this is the kind of stuff you must put up with to do plant-spotting in Australia. On the other hand, we were lucky enough to see a yellow-tailed black cockatoo, a majestic parrot considered by the Aborigines as foreboding rain: it actually rained shortly afterwards. And although we could not see one in the wild – the exact location where the few known specimens live is both inaccessible and undisclosed – the Blue Mountains are also the home of the Wollemi pine (Wollemia nobilis), a living fossil supposedly extinct since the Cretaceous that reappeared in 1994. It’s not a pine but a member of the family Araucariaceae, a relic of the Antarctic flora that used to cover the continent back in Gondwanan times. The hunt for carnivorous plants in the Blue Mountains has been a journey through time – past stages of the evolution of plants unfolding before our eyes, a tangible experience of what a forest looked and felt like millions of years ago – and through natural history – walking in the steps of people like Banks, Labillardière and Darwin makes you realize how adventurous an intellectual pursuit the study of plants has been. Allen Lowrie (2013). Carnivorous Plants of Australia Magnum Opus.